With the aid of sophisticated technologies new deposits of hydrocarbons are discovered beneath the waters of continental shelf all around the globe. The production goes farther offshore year after year and marine engineering technology has to develop in leaps and bounds to keep up. 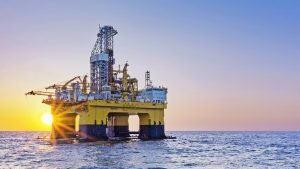 In this article we have collected world’s largest and most advanced offshore units for you to explore. On the 25th of December 2018 Shell has reported that wells have been opened at its Prelude Floating Liquefied Natural Gas (FLNG) facility which has become the biggest offshore LNG production unit ever created. 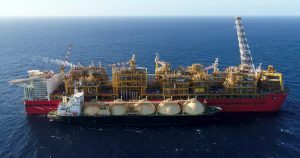 She was built to develop Prelude and Concerto gas fields located 200 km north-east off the coast of Western Australia and is expected to produce about 5.3 million tonnes of LNG and condensate per annum. Shell Prelude is almost 500m long, 74m wide, 100m high and weights 660,000 tonnes when fully loaded. But it is not all facility’s impressive metrics. More than 600 engineers were involved in her design while 240 crewmembers are required to operate it. The deck of new FLNG is larger than 4 soccer fields put together and her tanks could store as much liquefied gas as 175 Olympic size pools. Positioning the unit was, of course, a challenging task, so mighty thrusters generating 6,700 horsepower were used for the job. Moreover, the region where Prelude FLNG is destined to operate has quite a reputation for tropical storms. So, the mooring system is the unique piece of engineering as well. Hidden inside the facility is the 93m high turret which is moored securely to the seabed. It allows Shell Prelude to rotate or weathervane. Meanwhile, the chain attached to the 16 mooring lines comprises of more than 25 000 links making its one of the biggest in the world. All together the system is constructed to withstand category 5 cyclones. The cost of the project has risen beyond $10 billion; and it took over 4 years for Technip / Samsung Consortium in South Korea to build the facility. Now as Shell Prelude has started production it will be covering an annual gas demand of such city as Hong Kong by more 117% and will remain at this gas basin for at least 20 – 25 years. In 2017 the conglomerate of 7 Chinese shipyards delivered the world’s biggest and most technologically advanced ultra-deepwater semi-submergible drilling platform. It was christened Blue Whale 1. The rig is owned and operated by Bluewhale offshore, subsidiary of CIMC Group which paid $700 million for the construction of the unit. The height of DP3 Blue Whale 1 is 188m which equals a 37-storey building; the weight is 42 000 tons and its deck area is larger than a soccer field. The rig boasts an operating depth up to 3658 m (12 000 feet), drilling depth up to 15 240 m (50 000 feet). It is 30% more productive than comparable units, uses 10% less fuel and is built to withstand 200 km hurricane wind. These spectacular operational characteristics allow using Blue Whale 1 all around the globe. Moreover, Bluewhale 1 has already demonstrated her efficiency by participating in the extraction of natural gas from “flammable ice” in South China Sea (these are beds of methane trapped in molecular cages of ice). This project is said to bring China into the league of the ‘Oil Majors’ as this particular type of gas accumulations are actively researched at present and might be the future of energy. In addition, construction of the rig of such technological level is a sure sign that Made in China 2025 strategy that features 10 key industries and where ‘Ocean engineering and high tech ships’ takes 5th line proceeds according to plan. We have already featured world’s largest FPSO in the Offshore Digest before, but her story develops and this beauty truly deserves another appearance in this blog. Egina FPSO is a first Nigerian project of such level. The hull and basic modules were built by Samsung Heavy Industries shipyard in South Korea; then transferred to Nigeria where the local fabrication and integration facility was constructed to mount remaining topside modules of the FPSO. Completed she is 330 m long, 61 m wide and 34 m in depth. Storage capacity of Egina FPSO reaches 2.3 million barrels of oil while the weight of topside constructions is 60,000 tons. The project was commenced to develop a remote Egina oilfield 130 km off the Nigerian coast where depth of the sea reaches 1400 -1700 m. FPSO was commissioned in late 2018; and will be producing 200,000 barrels of oil per day increasing Nigerian output by 10%. Although technically FPSO Egina is impeccable her legal fate is still rather dubious. For instance, her price is likely to reach $5 billion instead of previous $3.3 billion as Samsung Heavy Industries Nigeria Limited which was responsible for the building topside modules keeps sending Notices of Dispute to Total (main investor and operator) and Nigerian National Petroleum Corporation, NNPC. In general, all participants of the FPSO Egina project now meet in federal court only. Meanwhile, it was reported that LADOL Shipyard in Lagos which built the famous FPSO was barricaded with concrete blocks and electric fences on Christmas Eve 2018. Talking about Oil&Gas giants it is impossible to omit Berkut, the rig which still holds the record for the biggest above water offshore drilling platform. The project named Sahkalin – 1 is a joint venture between four companies: American Exxonmobile (30%), Japenese SODECO (30%), Russian Rosneft (20%), and Indian ONGC Videsh Ltd (20%) and it cost them over $12 billion to build the rig in Nakhodka (Russia) back in 2013. 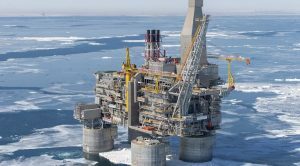 Berkut develops Arkutun-Dagi oil field in the Sea of Okhotsk 35 km off the Sakhalin island coast where it extracts about 4.5 million tons of oil per year (1% of all oil produced in Russia). Apart from the colossal size (the weight of the topside construction is over 200,000 tonnes and height with the bottom is 144m) engineers endowed Berkut with a number of fascinating qualities. For instance, the platform can withstand a 9 magnitude earthquake, subzero temperatures of up to -44OC, 18m waves and 2 meters ice pressure and continue drilling with normal operational efficiency. As expected, Berkut is equipped with the most powerful drilling mechanism in the world. Top drive of the blasthole drill has a rotational moment of 142 kH per meter and lifting capacity of the machine of 1150 tons which allows drilling wells with maximum vertical deviation up to 7 km. There will be 45 wells drilled in total by Berkut for the 35 years development of this field. All in all, it is possible to take any offshore unit and feature it as an object of fascination. Designed to perform technologically advanced operations in the extreme conditions they all are constructed with an utmost dedication to technology and safety. Therefore it will be an ever-lasting challenge for industry fans to explore their secrets.